Click on the bibliography of site references, a photograph to enlarge it, or a blue hyperlink of interest & scroll down for details. BCS Inc. opposes Beaumaris Motor Yacht Squadron Ltd’s plan for a huge private marina in Beaumaris Bay. It is totally inconsistent with why Beaumaris Bay Fossil Site was on the Register of the National Estate. The site and nearby sea are zoned Public Park and Recreation. The Fossil Site on the shore and seabed is of international scientific importance. It has Bayside Planning Scheme’s only Environmental Significance Overlay. BMYS Ltd’s plan – to erect 550 metres of high sea walls to privatize an area that is presently public sea; to build an 88-metre long boat storage shed against the Beaumaris Cliff, and as high as it; and to monopolize 4.8 times the company’s present area – has totally unacceptable environmental effects, so please take one or more of the actions BCS Inc. suggests here. Views above, at various times, of the Beaumaris Bay Fossil Site at the centre of Melways Reference 86F8. Click here to see the Beaumaris Bay Fossil Site at dawn. Click here for zoomable high resolution views of Beaumaris Bay. Click on a photo above to enlarge it. Click here for a bibliography of the Beaumaris Fossil Site. 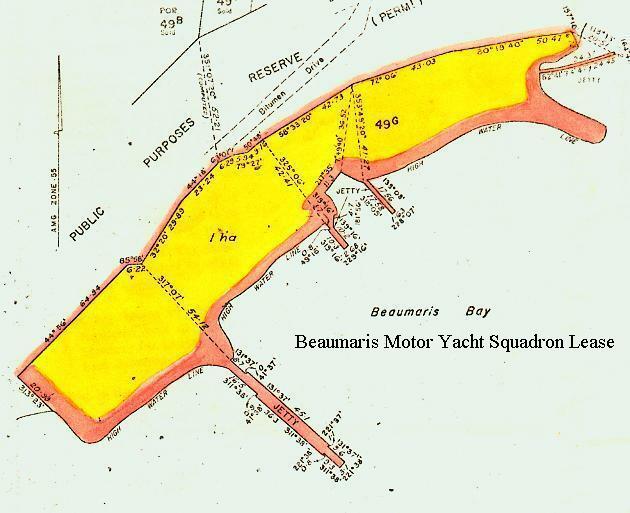 Click here for Wikimapia view of Beaumaris Bay. The Environment Effects Statement for the company’s proposed marina in Beaumaris Bay is expected to be forwarded to the Minister of Planning for consideration by June 2017 following which the Minister would put it on public exhibition. At the end of the public exhibition period, the Minister for Planning will appoint an independent Inquiry to consider the effects of BMYS Ltd’s marina proposal, having regard to the EES and public submissions. The Inquiry is expected to conduct formal public hearings from mid-2017 at which BMYS Ltd and people and organizations that have made submissions can make presentations. Following receipt of the Inquiry’s report, the Minister will prepare an assessment of the environmental effects of the proposed project and provide this to relevant decision makers. The Australian Heritage Database now includes the application for National Heritage Listing lodged by the consortium below. GIANT WHALE TOOTH AT BEAUMARIS: Museum Victoria confirms Beaumaris as the site of Australia’s largest-ever whale tooth find. ARTICLE IN VNPA MAGAZINE: The threat to Beaumaris Bay is reported in Victorian National Parks Association’s March Park Watch. BMYS LTD. WEBSITE NEWS: A BMYS Ltd. ‘fact sheet’ confirms Blairgowrie-like 3.5 m high concrete ‘wave-screens’ instead of rock walls. MLC ASKS MINISTER TO NOT RENEW BMYS LTD LEASE: The Greens MLC for Southern Metropolitan Region, Sue Pennicuik, has asked, in Parliament, for the Environment Minister to not renew Beaumaris Motor Yacht Squadron Ltd’s lease when it expires in 2018. A consortium consisting of palaeontologists, geological experts and community groups – one of which is Beaumaris Conservation Society Inc. – in February 2016 nominated Beaumaris Bay, but not including the area leased by BMYS Ltd, for Australia’s National Heritage List. ABC1 TV NEWS: See news video and a partial transcript of palaeontologist John Long and the BMYS Ltd Commodore on the impact of the 2008 proposal for a private marina – not a public marina as stated. The transcript omits the Commodore’s prediction that, “when it is done, people will see the benefits in it, and I think it will be well accepted in the area”. That prediction overlooks the wider community’s dislike of the existing marina’s impact, which became a fait accompli 54 years ago – in the Bolte era. That dislike is larger for the much larger threat to Beaumaris Bay, but it would be too late to reverse a 2nd fait accompli after it was built, so Beaumaris Bay should be saved from its impact. ARTICLE IN THE CONVERSATION: Professor John Long of Flinders University, SA, has a fine article on the Beaumaris Bay Fossil Site. VISUAL IMPACT OF JUST ONE 20-METRE POWER BOAT: Click here to see the visual impact of just one 20 m boat in Beaumaris Bay. FOSSILS OF BEAUMARIS: An excellent downloadable publication here – courtesy of Museum Victoria, and the Sandringham Foreshore Association – has fine photos of Beaumaris fossils with their names and description. FOSSIL EVENT: Over 1,000 people attended Professor Tim Flannery and others’ talks in February 2015, well reported by Wild Melbourne. ARTICLE ON EVE OF FOSSIL EVENT: The Age on Friday had an illustrated article on the Fossil Site before the Fossil Event above. CHANNEL 7 NEWS ITEM ON MARINA PROPOSAL: Peter Hitchener reported on the BMYS Ltd marina controversy for Beaumaris Bay. NEW WEBSITE OPPOSES MARINA PLAN: The website nobeaumarismarina.com campaigns strongly against the Beaumaris marina. STATEMENT BY U.S. PALAEONTOLOGY SOCIETY: The Paleontological Society supports protection of the Beaumaris Bay Fossil Site. ROYAL SOCIETY OF VICTORIA SUPPORT FOR FOSSIL SITE PROTECTION: A significant position statement by this long-established scientific society highlights the need for Victorian Govenment protection of the internationally important Beaumaris Bay Fossil Site. BMYS LTD. WEBSITE NEWS: The company revealed its February 2015 news on its “safe harbour”. Or would it be an “unsafe harbour”?. NEIGHBOURING GROUPS SUPPORT FOSSIL SITE: The Bayside Leader reports on support that neighbouring conservation groups, from Sandringham to Mordialloc, are giving to Museum Victoria in its longstanding work to stress the site’s international importance. 5 MILLION-YEAR-OLD SEA TURTLE FOSSIL: Read of the discovery of this significant fossil at the Beaumaris Fossil site. BMYS LTD. NEWS ON ITS WEBSITE: The company published its November 2014 news on its marina proposal revising its September 2014 news on the proposal. Its November 2014 news includes a hyperlink to a ministry website that has a BMYS Ltd document with a superseded date for an “Open Day” for “stakeholders”, but no time appears, and emails seeking times go unanswered. The company eventually held an Open Day on 01 February 2015. BMYS LTD. DEFENDS ITS MARINA PLAN: The Age reports on the growing major controversy over the future of Beaumaris Bay. ONLINE PETITION TO SAVE BEAUMARIS BAY FROM A MARINA: Consider signing the petition, and perhaps comment also. MARINA OPPOSED: A Bayside Leader article reports on BCS Inc’s opposition to the marina threat to Beaumaris Bay. The enigmatic statement that the BMYS Ltd. marina application was ‘currently on hold’ appeared on Victoria’s Planning Ministry website until the second half of 2014. when it changed to read, ‘Environment Effects Statement is being prepared’. BMYS Ltd’s website statement of 1 May 2014 updating the immediately preceding statement of 1 September 2012 on work so far, and its revised expectation that public comment on EES will be sought in late 2014. Result of BMYS Ltd’s 2013 postal ballot on proceeding with its marina plan was – with only 67% of the 665 members actually voting – a 69% YES vote. That percentage of members voting YES was barely 46% of the squadron’s 665 members, 54% of whom did not vote YES. 21% voted NO. 33% failed to vote. The YES percentage was 8% lower than it was in the 2008 postal ballot on that same question. A ‘NO’ CASE RE MARINA: BMYS Ltd’s 2013 members’ postal ballot again had a ‘YES’ case only. For fairness, see BCS Inc’s ‘NO’ case. BMYS Ltd’s website statement of 1 September 2012 on work so far, and expectation that public comment on EES to be in late 2013. Victorian Government’s 2012 written response to Recommendations E and E4 of the Victorian Environment Assessment Council’s 2011 Final Report below by supporting (Page 18) those recommendations, to establish a “Beaumaris Cliffs Geological and Geomorphological Features Reserve”, but going further by including the terrestrial Beaumaris fossil beds from Charman Road to Table Rock Point, which is more than double the area the VEAC recommended. The VEAC’s final report cited the Beaumaris Bay Fossil Site as Melbourne’s only Geological Site of International Significance, but it did not include marine areas in its specific recommendations. Legal force ceased to apply, from February 2012, for all National Estate registrations, including the Beaumaris Fossil Site, following earlier changes to the legislation that had established the Register of the National Estate. 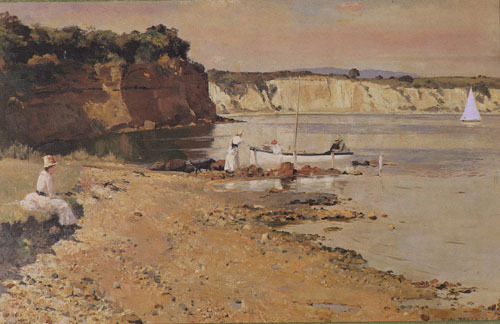 Victorian Environment Assessment Council’s Final Report on its Melbourne Metropolitan Public Land Investigation cites the Beaumaris Bay Fossil Site as Melbourne’s only Geological Site of International Significance. 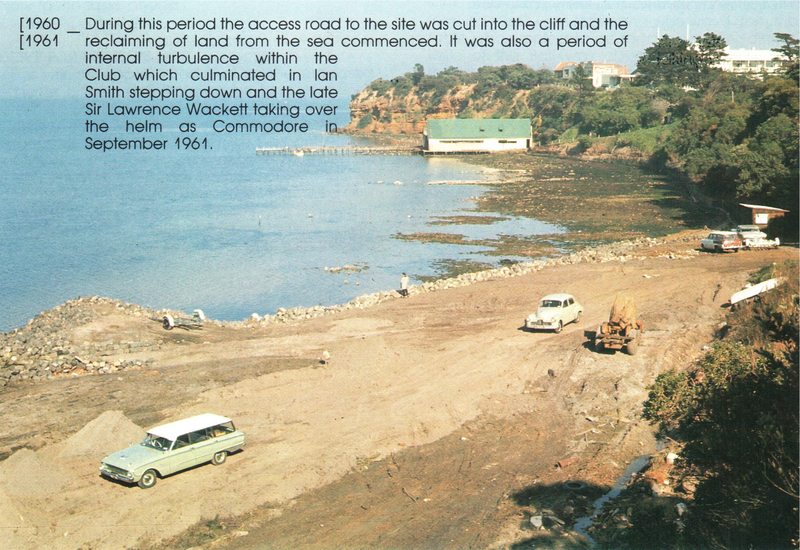 Its Recommendation E4 (see Pages 87 and 88) is a 3-hectare “Beaumaris Cliffs Geological and Geomorphological Features Area” between Charman Road and Hutchison Avenue, from low tide mark to the edge of Beach Road. Pages 29 and 30 of a 2009 report to VEAC detail 3 Beaumaris sites. BMYS LTD MARINA SCOPING DOCUMENT: DPCD sought public comment on this document. See the BCS Inc. submission. Geological report to Victorian Environment Assessment Council details 3 Beaumaris Bay fossil sites (see Pages 29 & 30). Marina and more Bay filling on the Beaumaris Bay Fossil Site, and more works sought by Beaumaris Motor Yacht Squadron Ltd on its leased, filled site, but BCS Inc. opposes such intrusion into Beaumaris Bay, as shown in a the Bayside Leader’s front page report on 2008-06-02. See the 2008 brochure detailing the private marina proposal and its funding. BMYS Ltd’s postal ballot of its members in June 2008 to proceed with the Board’s marina application was accompanied by a statement of the Commodore’s case in favour. The Board refused to let the many members opposed to the application proceeding have circulated with the ballot papers a case against the Board’s plan. The result of the ballot was a YES vote of just over 75% of those voting. 2007 article in Powerboat World magazine entited, “Beaumaris Motor Yacht Squadron looks to future” gave a forewarning of the company’s ambitions for, and attitude to, Beaumaris Bay. 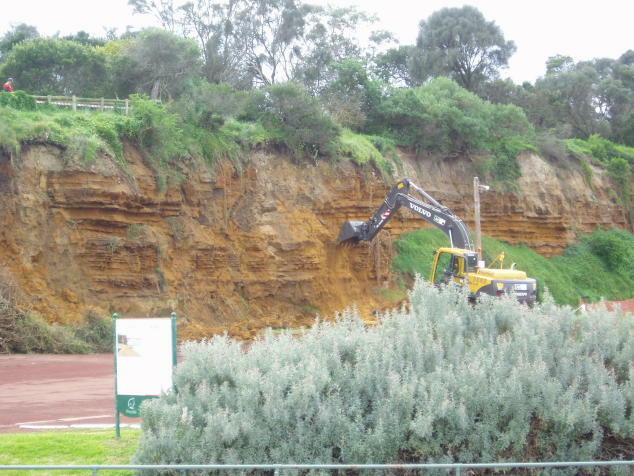 A coup resulted in letting the excavator in the photo above permanently deface the Beaumaris cliff rather than cordoning off a safe zone below for inevitable odd rock falls. Dr Tim Flannery’s book, The Birth of Melbourne, refers on Pages 4 and 20 to the internationally significant Beaumaris fossil beds. 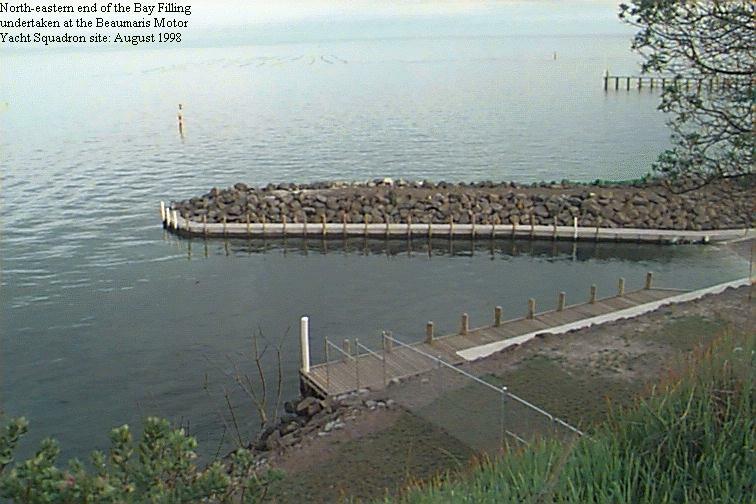 The Action 11K of Bayside City Council’s 2001 Black Rock – Beaumaris Foreshore Master Plan gives as a Priority 1 “Re-inforce and encourage public access to the area surrounding the BMYS compound and associated jetty” – which has never been implemented – contrasts with the forbidding sign next to a needless BMYS gate. The Plan has been removed from Council’s website. Bayside Planning Scheme: Zoning of the Beaumaris Bay Fossil Site and the BMYS Ltd. leased land is PPRZ (Public Park & Recreation Zone) with Schedule 1 to the Environmental Significance Overlay ‘Beaumaris Bay Fossil Site’ and Schedule 1 to Vegetation Protection Overlay ‘Coastal Areas’. ESO Schedule 1 cites the fossil of the extinct penguin species Pseudaptenodytes macraei, named after its finder, Colin Macrae, the second President of BCS. It refers to the many fossils of the echinoid Lovenia. Barnacles are another invertebrate fossil here. This Environmental Significance Overlay is the only ESO in the City of Bayside. Geological map showing the Beaumaris Monocline, which continues in the same direction straight inland, via the intersections of Warrigal and Centre Dandenong Roads, Cheltenham, and Clayton and Centre Roads, Clayton, extending to its end near the top of Wheelers Hill, which is close to and at right angles to, the Wheelers Hill fault at Dandenong Creek, at the foot of Wheelers Hill. The second page, from the Atlas of Victoria 1982, shows the 1891 population distribution and municipal boundaries in Melbourne and environs. 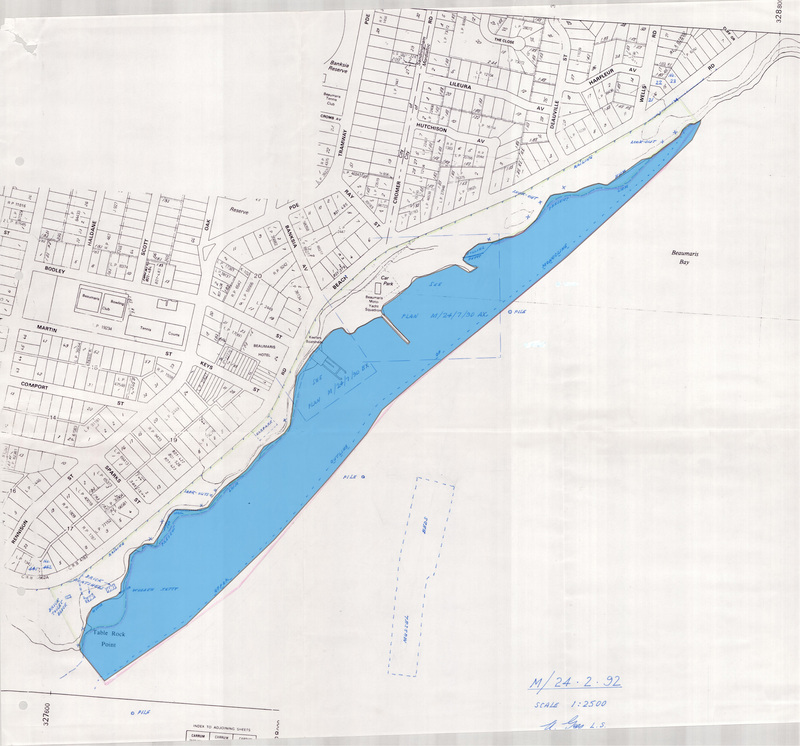 BMYS Ltd. lease of seabed site under Section 134 of Victoria’s Land Act 1958, for 21 years from 1997-07-01 to 2018-06-30, replaced the first (1981-2002) lease. Rent for the current lease began in 1997 at $13,000 per year. Also see the lease as Pages 1-34 and Pages 35-50. The Hon. Mark Birrell MLC gave his second reading speech in the debate on a Bill on 1994-05-29, on Page 973 of the Legislative Council Hansard, which was resumed the next day (see Pages 1094-1101). He recited, in relation to Clause 15 of the Bill, the history of the tenure of the BMYS Ltd site. That was followed, after an amendment the next day by Hon. Barry Pullen MLC, which was lost on party lines, and an enlightening contribution by Hon. Geoffrey Connard MLC, a local member, by an Act of Parliament that altered the Reserve below. Section 15 of that Act altered the reservation as a Permanent Public Recreation Reserve made by a 1906 Order-in-Council that had extended the Moorabbin Beach Park here, to reduce the Reserve’s area by 2,000 square metres ostensibly to redress the original impropriety of leasing that part to BMYS Ltd. A BCS letter explained why it opposed that cheap, one-sided expediency by the Government and Parliament. Letter sought Government consent to fill 6,000 square metres more of Beaumaris Bay to extend north-east end of the BMYS Ltd. area. The fill occurred in 1998. No public notice there tells the public that. Instead, a questionable gate – usually unlocked – exists across the access path, near the controversial notice pictured above. Official Government Ground Plan of the BMYS Co-op. Ltd. 21-year lease: RED AREAS must stay open at all times to full public access on foot. Fossil barnacles reported in “Fossil barnacles (Cirripedia: Thoracica) of New Zealand and Australia”, Buckeridge J S.
Excerpts from the proposed Lease of Seabed by the Crown to BMYS Co-op. Ltd. This first lease of this hectare of Beaumaris waterfront land, for 21 years, at $500 per year ($9.60 per week) for the first 5 years, began on 1st July 1981, and superseded the permissive occupancy that began in 1960. The lease was replaced in 1997, five years before its expiry, by the current lease. Hansard on proposed 21-year lease to BMYS to supersede its permissive occupancy. Paper, by Professor George Gaylord Simpson, Professor of Paleontology at Harvard University, in National Museum of Victoria Memoirs, on the Miocene penguin fossil found by Colin Macrae. Named Pseudaptenodytes macraei after Mr Macrae. In the late 1960s, the then operator of the St Kilda Marina sought permission from the then Mordialloc City Council to build a large marina at the head of Beaumaris Bay, just below the end of Charman Road, but were, after a strong campaign by the Mordialloc-Beaumaris Conservation League, refused that permission. A black and white photograph of the BMYS Co-op. Ltd. clubhouse. The photograph’s top right shows the tip of the former Keefer’s boat shed jetty. At about this time, a low resolution monochrome aerial photograph shows the wider scene around the BMYS site.. Framework of the BMYS Co-op. Ltd. clubhouse being erected on its permissive occupancy filled seabed, with the then Keefers boatshed in background at right. The history of the BMYS tenure was recited in Parliament later (see 1994 above). A colour photograph of the creation of the filled car park and BMYS clubhouse site. Report in The Age newspaper of alleged unauthorized removal of foreshore vegetation by Beaumaris Motor Yacht Squadron Co-op. Ltd. and – contrary to the headline – the intention of the Sandringham City Council to prosecute BMYS for that removal. 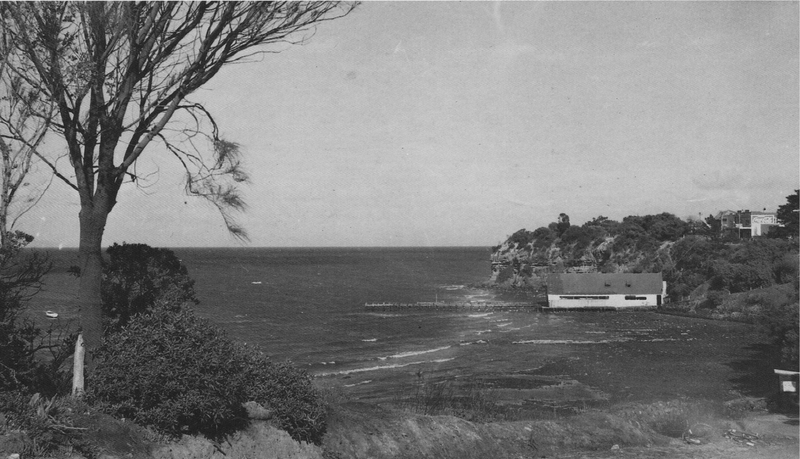 A black and white photograph of the Crown land and seabed that Beaumaris Motor Yacht Squadron Co-op Ltd. gained permissive occupancy of, and later filled, and then leased, from 1981. BMYS began in February 1959, became Beaumaris Motor Yacht Squadron Co-op Ltd. on 1960-01-28, and changed to a company limited by guarantee on 2004-12-23. See a crass local newspaper report “Beaumaris Foreshore to get £65,000 Facelift” on the BMYS proposal, which was for mooring 200 boats and a 250 feet (75 metres) long dinghy shed. No boat storage nor the shed ever eventuated, but 56 years later, in 2015, BMYS was again seeking a permit to store 200 boats, and to build an 88-metre long shed alongside the Beaumaris Cliff. Edmund Gill’s paper, in National Museum of Victoria Memoir No. 21, on the Stratigraphical Occurrence and Palaeoecology of some Australian Tertiary Marsupials, refers to the Beaumaris Cliff fossil site from Page 165 onwards. A 1951 Lands Department aerial photograph of Beaumaris, as a 16 MB zoomable PDF, shows the pattern of water depths and coastline at what is now the site of Beaumaris Motor Yacht Squadron Ltd’s lease before the cliff, shore and nearby seabed were greatly modified. A 1950 postcard view – unfortunately at high tide – of the site of the BMYS Ltd. lease before it was granted. A 1915 postcard view – fortunately at low tide – of the site of the BMYS Ltd. lease before it was granted. A 1910 postcard view at low tide, and a 1910 postcard view at high tide – of the site of the BMYS Ltd. lease before it was granted. 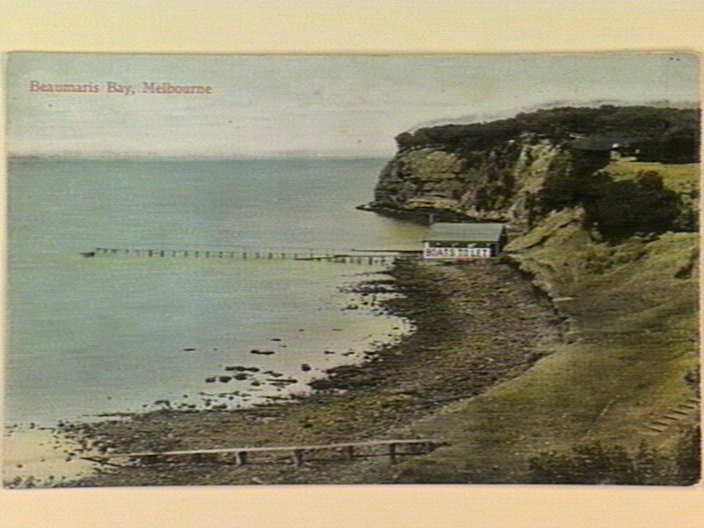 A 1909 photograph of the Beaumaris Sea Baths, at high tide, formerly on part of the site since leased by Beaumaris Motor Yacht Squadron Ltd. showing the cliff a short distance north-east of the former Keefer’s boat shed, which was first granted its licence for a jetty in 1905. The cliff where the current access road to the BMYS Ltd. site was created is shown intact in this early photograph.